Metro route 5 local and express buses travel on Phinney Avenue and stop in front of the Phinney Neighborhood Center at the corner of 67th and Phinney. When you see North 65th Street on the northbound bus, you're getting close. When you see North 70th Street on the southbound bus, you're getting close. Travel south to exit 169, which is also signed "NE 50th St/NE 45th St". The offramp splits in two immediately after leaving the freeway; veer right at the first of the routes, which is also signed "NE 50th St/Seattle Pacific Univ". Continue with the offramp to 50th Street (the first stoplight). 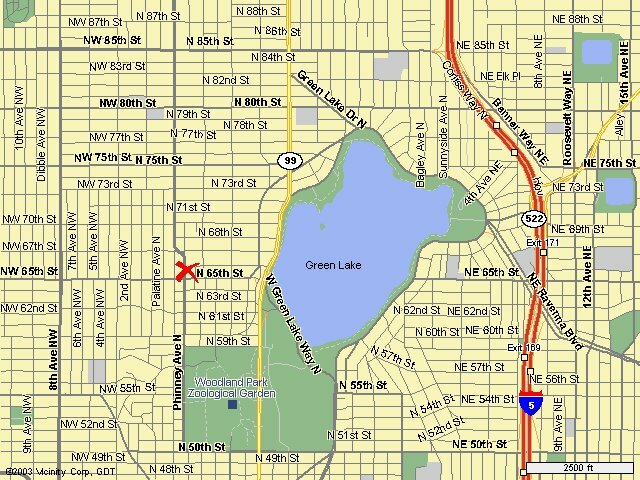 Turn right on 50th and travel west about 1 1/2 miles to Phinney Avenue North (watch the street signs after 6 stoplights so you don't get in the wrong lane accidently). The arterial curves to the right and becomes Phinney Avenue North. Travel north on Phinney about 1 mile. When the road veers to the left, turn right instead onto North 67th Street (when you see Starbucks, you're getting close). Travel east on 67th down the hill to the second driveway on your right. Enter the driveway and park anywhere in the lot. Travel north to exit 169, which is also signed "NE 45th/NE 50th". The offramp splits in two immediately after leaving the freeway; veer left at the first of the routes. Continue under a bridge to 50th Street (the first stoplight). Turn left on 50th and travel west about 1 1/2 miles to Phinney Avenue North (watch the street signs after 7 stoplights so you don't get in the wrong lane accidently). The arterial curves to the right and becomes Phinney Avenue North. Travel north on Phinney about 1 mile. When the road veers to the left, turn right instead onto North 67th Street (when you see Starbucks, you're getting close). Travel east on 67th down the hill to the second driveway on your right. Enter the driveway and park anywhere in the lot. Travel east on Northwest 65th Street to Phinney Avenue North. Turn left and travel north on Phinney 2 blocks. When the road veers to the left, turn right instead onto North 67th Street (when you see Starbucks, you're getting close). Travel east on 67th down the hill to the second driveway on your right. Enter the driveway and park anywhere in the lot. Travel north on 15th Avenue Northwest across the Ballard Bridge. At Northwest 65th Street, turn right. Travel east on Northwest 65th Street to Phinney Avenue North. Turn left and travel north on Phinney 2 blocks. When the road veers to the left, turn right instead onto North 67th Street (when you see Starbucks, you're getting close). Travel east on 67th down the hill to the second driveway on your right. Enter the driveway and park anywhere in the lot.